Crime Watch: Schrier scoops Arthur Ellis Award! Schrier scoops Arthur Ellis Award! A few hours ago (Thursday night in Canada), the annual Crime Writers of Canada Arthur Ellis Awards, which honour the best in mystery writing in Canada, were held. The 'top prize' of Best Novel went to Howard Shrier, for his second crime novel, HIGH CHICAGO. 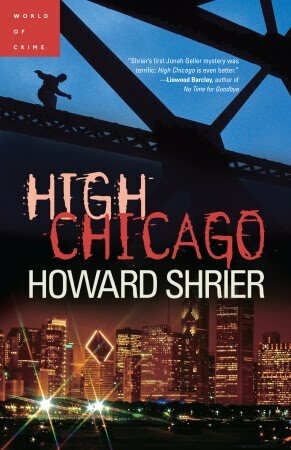 The publisher's blurb for HIGH CHICAGO, the second book in Shrier's Jonah Geller series, states, "Toronto investigator Jonah Geller has opened his own agency, World Repairs, and he and his partner, Jenn Raudsepp, are immediately drawn into investigating the apparent suicide of a young girl — and the high-stakes world of construction and development on a long-neglected parcel of Toronto’s waterfront. Clues lead them to suspect that fabled real estate tycoon Simon Birk — the partner of the dead girl’s father — is killing people who get in the way of the project, but the evidence isn’t rock solid. And Jonah has to craft an audacious plan to take down one of Chicago’s most powerful men." The award confirms a very promising start to Toronto-based Schrier's writing career - and makes him two from two - the ex-journalist's first mystery novel, BUFFALO JUMP (2008), which introduced readers to Geller (a Toronto investigator), won the Crime Writers of Canada's Arthur Ellis Award for best first novel. Short story: Dennis Richard Murphy, Prisoner in Paradise, Ellery Queen Mystery Magazine. Best non-fiction: Terry Gould, MURDER WITHOUT BORDERS. The Crime Writers of Canada also handed the Derrick Murdoch Award, which honours outstanding contributions to crime writing, to veteran author Peter Robinson.